Curtis Sittenfeld is the author of the bestselling novels Sisterland, American Wife, Prep, and The Man of My Dreams, which have been translated into twenty-five languages. Prep was chosen as one of the Ten Best Books of 2005 by The New York Times, and American Wife was chosen as one of the Ten Best Books of 2008 by Time, People, and Entertainment Weekly; both were nominated for the UK’s Orange Prize. Curtis’s non-fiction has appeared in many publications, including The New York Times, The Atlantic Monthly, Salon, Slate, Glamour, and on public radio’s “This American Life.” A graduate of Stanford University and the Iowa Writers’ Workshop, Curtis has interviewed Michelle Obama for Time, appeared as a guest on NPR’s “Fresh Air” and CBS’s “Early Show,” and been a strangely easy “Jeopardy!” answer. "Sisterland" is a book I waited a while to read because it was like a secret chocolate that was too good to rush into, I thought. It sat in my TBR stacks for a couple of months where I could see it on a daily basis and savor the time when I could pick it up for a wonderful reading experience. I had such high hopes. Maybe my hopes were too high... I did enjoy the book, but I found it slow-going for the bits of pleasure it gave. Curtis Sittenfeld gives us a study in relationships in this novel. Primarily, it's the study of sisters, of course, but it's also the interactions between friends and husbands and wives, and parents and children. She is a keen observer of such relationships without a doubt, because no leaf is left unturned, it seemed. I had a problem, however, in that I found much of the story dragged and I wasn't inclined to become attached to any of the characters so their individual characterizations and "feelings" didn't much touch me. The closest I came to caring was when she told about the twins as young girls and their relationship to their mother...a sort of non-relationship. I don't know. The book left me cold, and I was sorry about that. I wanted to like it so much! The supernatural/psychic aspects of the novel were beautifully couched in 21st century skepticism and the fear and trepidation of the other identical twin. I did enjoy this aspect of the book, but it wasn't enough to carry the whole for me. I liked the realism of this situation as it played upon the two sisters and their outer circles. I have to admit this is one of those books I skimmed to the end. I rarely if ever do that. I was sad to have to do that here. Even so...it was a disappointment. It's one of those books that didn't even conclude in a way I'd hoped. But, I have to say it was a very well-devised ending! 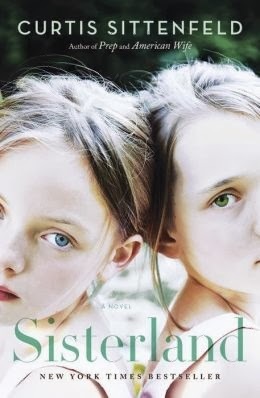 Here's my conclusion: I would give the book a 3 stars and a recommendation to wait until it comes out in paperback unless you're just crazy about reading about sister relationships in the finest and not too exciting detail. I have been eyeing this book for a while (mostly because of my relationship with my own sister) yet when I read the first part of your post, it began to feel like a book that I would care for and when I read that it let you cold, I realized I felt the same way. Too bad, sisters are such juicy material for books. Thanks for sharing your review.